If you’re in a hurry, you will inevitably miss the turn-off on the 514 highway from Catania, Sicily. You will need to hit reverse, highly illegal, so you don’t end up driving all the way towards Francofonte along a sort of garden of Hesperides nymphs, where the road is a grey strip between orange trees; down, down to the Iblei mountains where the leaves of the olive trees are a faded green. Don’t let yourself get that far. Leave the 514 and enter another space-time zone, feeling the rhythm of the tires hit the dirt road as it leads you, curve after curve, to the Soprano mill. Now, don’t think about the Sopranos, and not even Maria Callas. The mills, Franco Distefano explains to us with an amicable smile while covered in white flour, are distinguished as soprano and sottano – upper and lower, in relation to the course of the water. Naturally, the advantage goes to the mills above the flow of water. They can use the force of energy from the water current to move the wheel that cranks the grinder. Talk about clean energy! Franco accompanies us behind the mill to show us the wheel, which is horizontal in Arabic tradition. Its water source comes from the Ippari river. The son and grandson of millers, Franco rebaptized his mill by simply making the adjective (“sopra,” or upper) into a noun (“soprano”). Infected by the same passion to be a miller as his father and grandfather before him, Franco was frustrated when forced to choose another line of work because of the small profits he received during rather punishable decades for artisan producers. He began incubating his dream after his father closed the mill in 1985, and in 2004, he had it restored and put back into production capacity. From the beginning, he knew the right question to ask: “Which grain?” What type of grain should he grind? Studious and impassioned, he immediately decided to grind only ancient Sicilian varieties. He collaborates with agronomists from Catania University, researches, and attends lectures and conventions. He looks to the livestock breeders for allies. “Ancient grains are cost effective for the breeders, because they grow tall and provide a rich source of feed for the animals, scraps which are just seen as a waste for most grain farmers.” In addition, he notes slyly, the breeders are surely concerned for the welfare of their livestock, and prefer feeding them natural products, without herbicides. Russello, Margarito, Timminia, long-grain spelt, Senatore Cappelli, and many other native Sicilian varieties like Paola, Inglesa, and Currìa profume the air of the Soprano mill. It’s open to the public on the weekends, at least until Franco has the courage to take the leap – that is, leave his “secure income” job at the electrical company and open the mill daily. 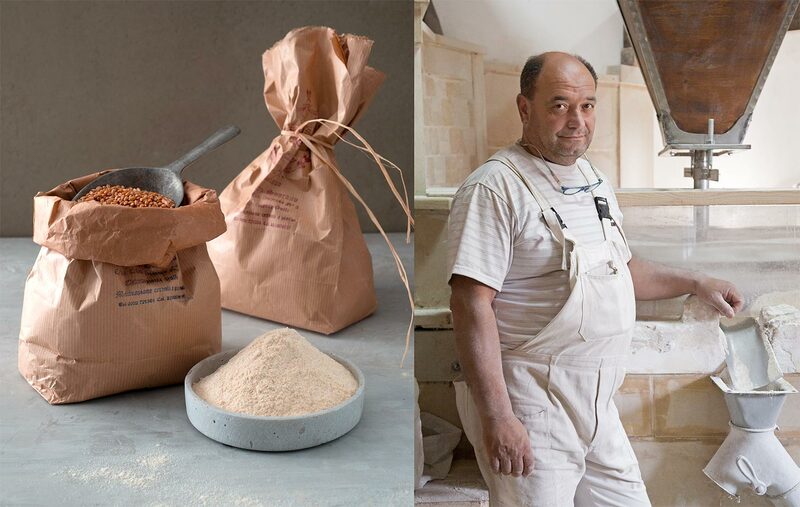 Now, starred Michelin chefs of the region have to book an appointment to stock up on his aromatic flours. We hope you get the chance to stop by there one day when they’re experimenting with bread. The bake it in the oven annexed to the mill, where the fire is kept burning with the shells of almonds, as per tradition. It gives off an incredible scent and leaves the bread golden and fragrant, irresistable after it’s brought home. 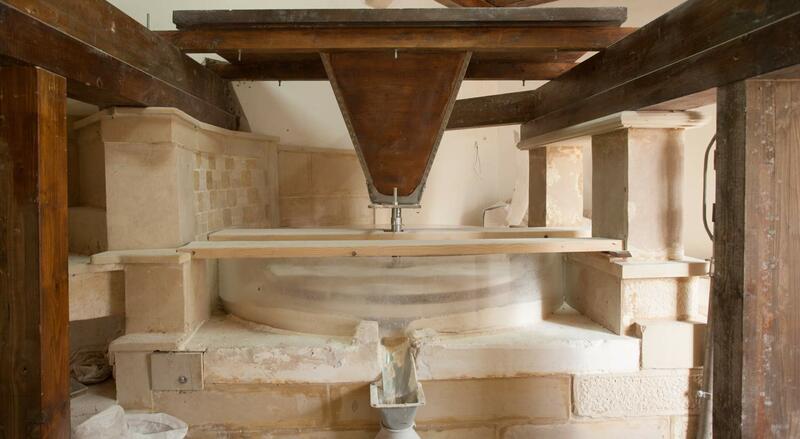 By the way: the flours from the Soprano mill are 100% natural. If you don’t use them immediately, it’s best to store them in the refrigerator or freezer. But why wait? asks Franco. “If you come all the way here to get my freshly-ground flour, then you’re going to make bread right away, right?” Indeed, his plan is flawless.